Gian Lorenzo Bernini (1598-1680) was an Italian artist and architect. A leading sculptor of the age and a fitting successor to Michelangelo, with fine skills in marble. 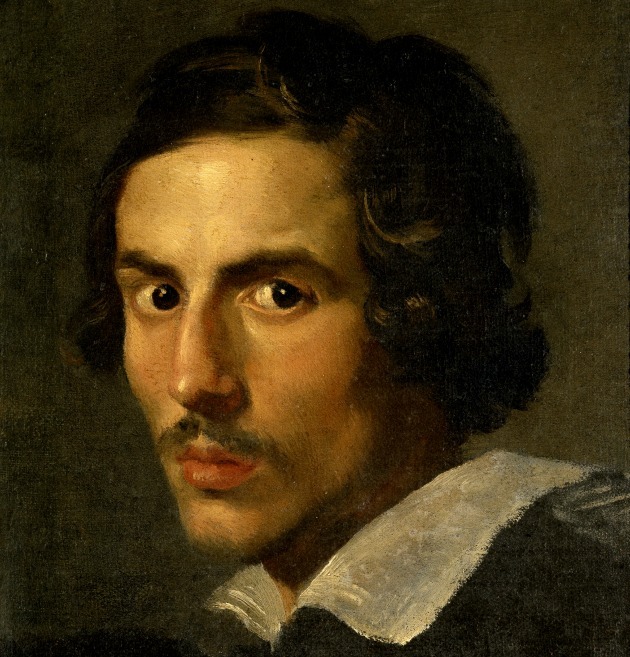 He was said to be the founder of the baroque style in architecture in Rome, his contemporaries being architect Francesco Borromini, and painter, Pietro da Cortona. He was born in Naples on the 7th of December 1598, one of 13 children, to sculptor Pietro Bernini, a Florentine, and Angelica Galante, a Neapolitan. He was very young when he moved to Rome with his father who was working for the Borghese family. Pope Paul V noticed the boy’s talent as did painter Annibale Carracci. He received recognition from Cardinal Scipione Borghese, papal nephew of Pope Paul V, and he made some of his early works for the garden of Villa Borghese, ‘Aeneas, Anchises, and Ascanius' (1619) and ‘Pluto and Proserpina’ (1621). When he was merely 22 he was commissioned to sculpt a bust of Pope Paul V and in 1621, at age 23, Pope Gregory XV knighted him. Though not keen to marry, a marriage was arranged with Caterina Tezio, a Roman woman, with whom he had 11 children, the youngest of these became his biographer, Dominico Bernini who wrote ‘Vita del Cavalier Gio. Lorenzo Bernini’ (published 1713). When Maffeo Barberini became Pope Urban VIII, Gian Lorenzo’s work blossomed under his patronage and in fact the Barberini Pope became his greatest patron. His sculptures entered a new period of sensitivity. Bernini had a talent in capturing and expressing a dramatic moment in time. The works ‘Apollo and Daphne' (1622) and ‘David' (1623) show his virtuosity and ability to catch a fleeting moment. It was under Pope Urban VIII that he worked on his first architectural projects, the façade and refurbishment of the church of Santa Bibiana (1624–26) and the St. Peter's baldachin (1624–33), the bronze columned canopy over the high altar of St. Peter's Basilica. 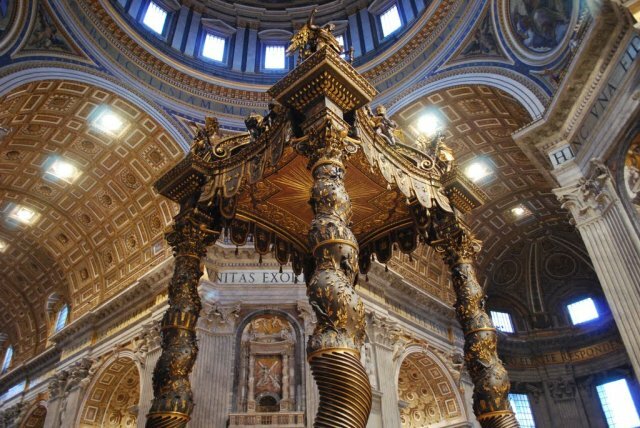 The baldachin brought sculpture and architecture into one art form,and represents an important development in Baroque church interior design and furnishing reflecting the genius of Bernini’s creativity. Bernini was a fervent Roman Catholic and his work was reverent and considered an asset to the church which hoped to inspire worshippers. He was given the position of Chief Architect of St Peter's and the Palazzo Barberini. 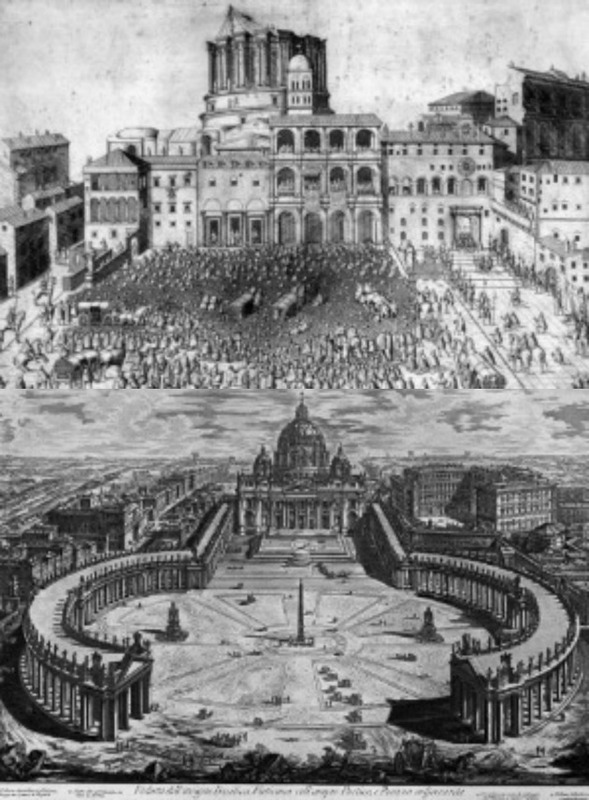 In 1628 he built the tomb of Urban VIII in St Peter's. It was in this time that Gian Lorenzo also worked on the dome of the basilica, four piers supporting massive statues, and built the first of his fountains ‘The Barcaccia’ in the Piazza di Spagna 1627. He worked on a series of busts of both Pope Urban VIII and Cardinal Scipione (1932). Bernini showed passion in the arts and in his private life. His affair with Costanza Bonarelli, the wife of one of his assistants, caused a stir. When he suspected that his brother got involved with Costanza, he badly beat him and ordered a servant to slash her face with a razor. Pope Urban VIII intervened on his behalf and he was fined. Bernini also had rivals in Alessandro Algardi and also Borromini. There was much competition for commissions but Gian Lorenzo achieved his goal in obtaining the work in St Peter's Basilica. In 1637, Bernini attempted to embellish the facade of the basilica, originally designed by Carlo Maderno earlier in the century, by adding two massive bell towers on each flank of the facade, making use of the foundations Maderno had supplied. When first tower was erected in 1641, cracks began to appear in the facade and, therefore, the project was immediately stopped. His opponents within the Roman artistic world pinned the blame on Urban's artist, and Bernini suffered, both financially and in terms of his reputation even though the problems were not necessarily his fault. Bernini fell out of favor during the Pamphili papacy of Innocent X, who took the Holy Seat in 1644, though he maintained Bernini in the roles given to him by Urban VIII. Work continued on beautifying the massive nave of St Peters, with tiled flooring, polychromatic marble and pilasters being added to the then-barren surfaces of the basilica. He regained a major role in the project of expanding, decorating and improving of St. Peter's with the Pope Alexander VII Chigi, which led to the redesign of the piazza and colonnade in front of St. Peter's and the Cathedra Petri, the Chair of Saint Peter, in the apse of St. Peter's. Bernini's fountains, each unique and each an example of baroque style and ingenuity, remain amongst his greatest creations. ‘Fontana della Baraccia’ in Piazza di Spagna, 'Fontana delle Api' in Piazza Barberini, ‘Fontana dei Quattro fiumi’ and ’Fontana del Moro’ in Piazza Navona, ‘Fontana del Tritone’ in Piazza Barberini. Bernini was by this time the most famous and revered artist in Italy. In 1639 Bernini bought property on the corner of via della Mercede and via del Collegio di Propaganda Fide and built the Palazzo Bernini, today it can be seen as 11 and 12 Via della Mercede. In 1665 he went to France where the people lined the streets to welcome this famous Italian artist. However, Bernini offended the French by praising Italian art over French, his projects were rejected and only the bust of King Louis XIV remains from this visit. On returning to Italy he built the small Baroque church ’Sant’ Andrea al Quirinale’ (1658), a work with which he was evidently well pleased, according to the biography written by his son Dominic. Pope Alexander commissioned Bernini to create a sculpture which would support the massive Egyptian obelisk in the Piazza della Minerva. Bernini worked with Ercole Ferrata to create the 'Elephant and the Obelisk’. Between 1663 and 1666 he also restored the 'Scala Regia’, the staircase leading to the Vatican Palace. Pope Alexander VII died in 1667 and had commissioned his own tomb but Bernini only completed it in 1678. It was his last major sculptural work. Pope Alexander was succeeded by Pope Clement IX who also held Bernini in high regard. In the Altieri Chapel in San Francesco a Ripa lies a sculpted figure, ‘The Blessed Ludovica Albertoni’ a testimony to the sensitivity of his work. At the age of eighty one and having served eight Popes, on the 28th of November, 1680 Bernini was laid to rest in the Basilica di Santa Maria Maggiore. Here was a man who left Italy with a magnificent number of treasures, sculptures and astounding architectural works of beauty and magnificence. The churches, the altars, angels, fountains, St Peter's square and the interior of St Peter's reflect the departure from the classic and the formal to a new visual, dramatic and energetic Baroque period of art and architecture. 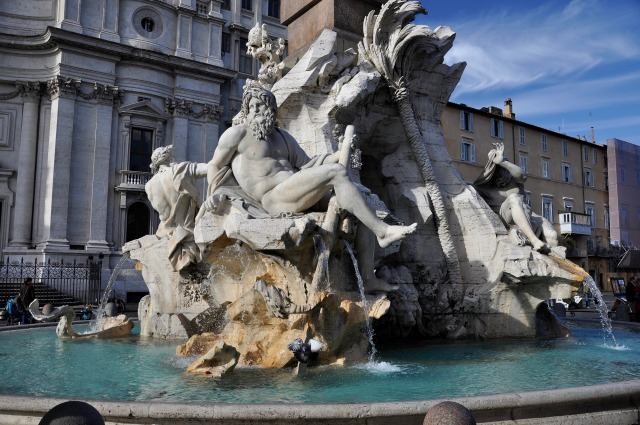 Bernini added more than treasure to Italy. He added a new style.